Scatola del Tempo Porta Penne Piccolo Collectors is a hand crafted flip open travel pen case in genuine calf skin leather with contrasting stitch and embossed exterior logo. Lined with an elegant pure jacquard silk interior and sturdy leather center divider with snap button closure ensures your fine writing utensils stay in place. 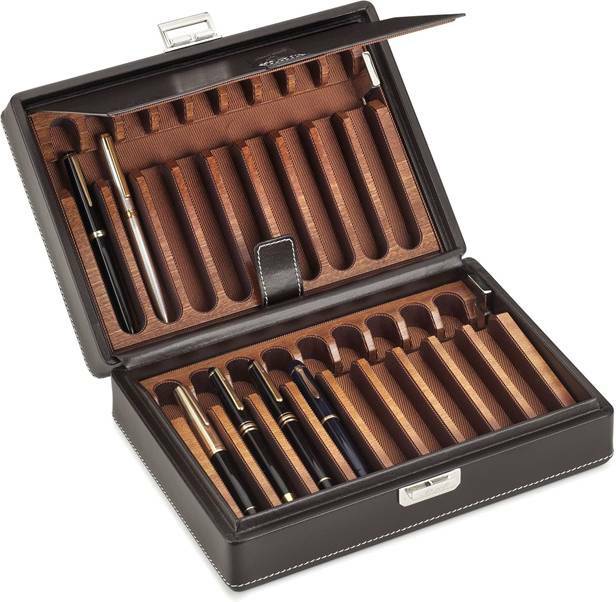 Equipped with 18 easy access individual compartments to hold oversize pens with a silver metal clasp closure with the Scatola del Tempo logo makes for a luxurious presentation while keeping your items safe and secure.